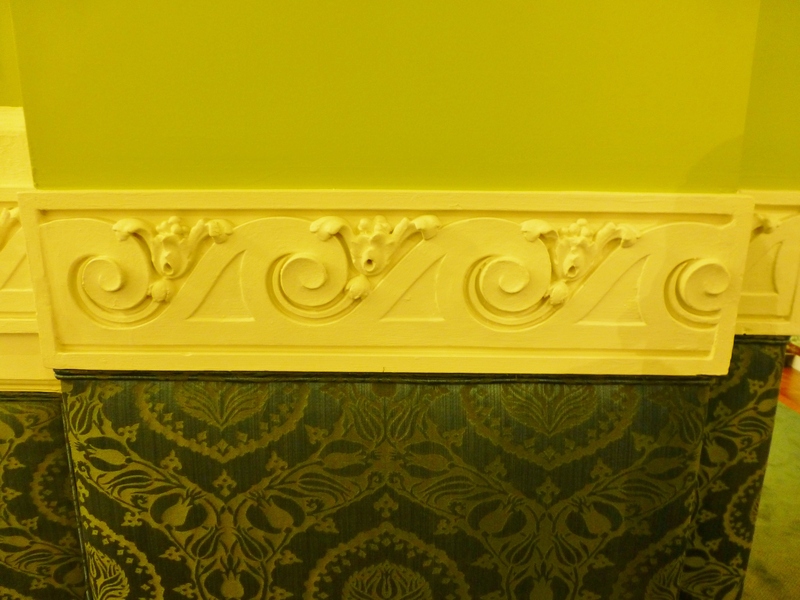 The color scheme chosen by Yarosh is very bold with a strong verdant green above the detailed chair rail with Grecian motifs. Below the elegant wave border the walls are upholstered in an absolutely gorgeous damask jacquard fabric featuring peacock blue and green. Welcome back to my little tour of the 2014 Mansion in May at Blairsden in Peapack-Gladstone, NJ. I know…it’s already 2015 and May was a long time ago, but truly this was one of the most fabulous designer houses I’ve ever attended and I still have many rooms left to share with you! This was my son, Grady’s, favorite room in the whole house! It is an atrium located at the center of the second floor in the mansion, and features a glass ceiling that emits wonderful natural light to the area. The atrium features a beautiful glass ceiling and is open to the mansion’s hallways on 3 sides. 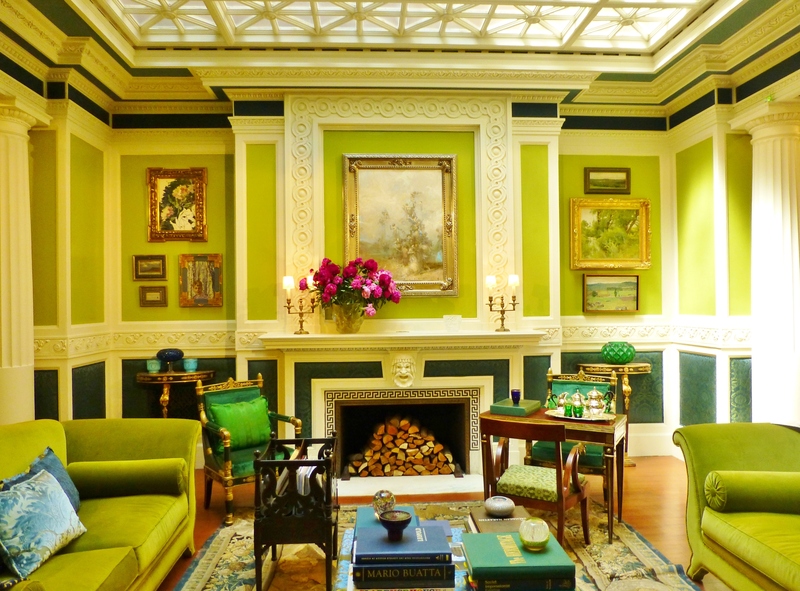 James Yarosh chose a vivid green, combined with peacock blue for the vibrant color scheme. The artwork used throughout the space is very impactful (which is not surprising, since Mr. Yarosh is an art dealer). 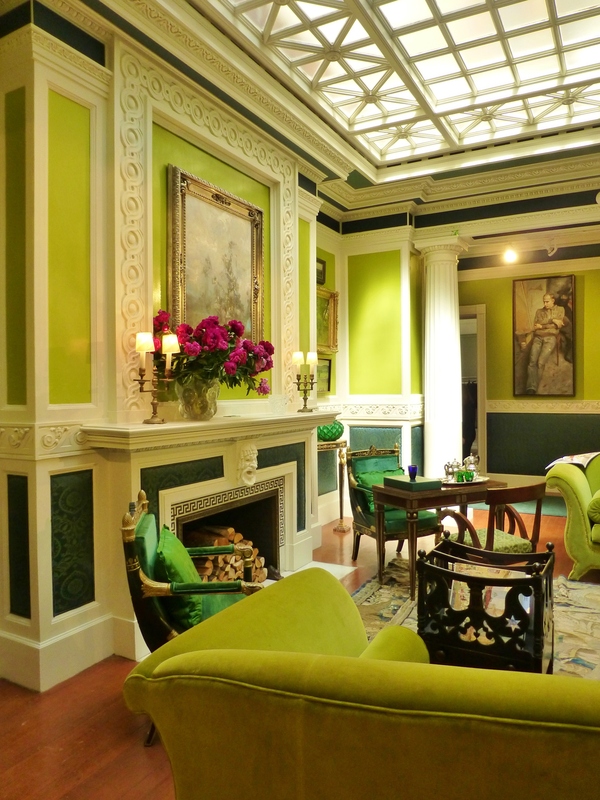 However, one of my favorite things about the space is the magnificent use of antiques throughout. Glorious antiques were used in this room, alongside valuable Lalique glass accessories. And of course, the artwork just shines in this atrium! This photo features Mr. Yarosh visiting with a patron of the designer house. In front of him, a stunning octagonal borne (or round-a-bout chair) was used at one end of the room. 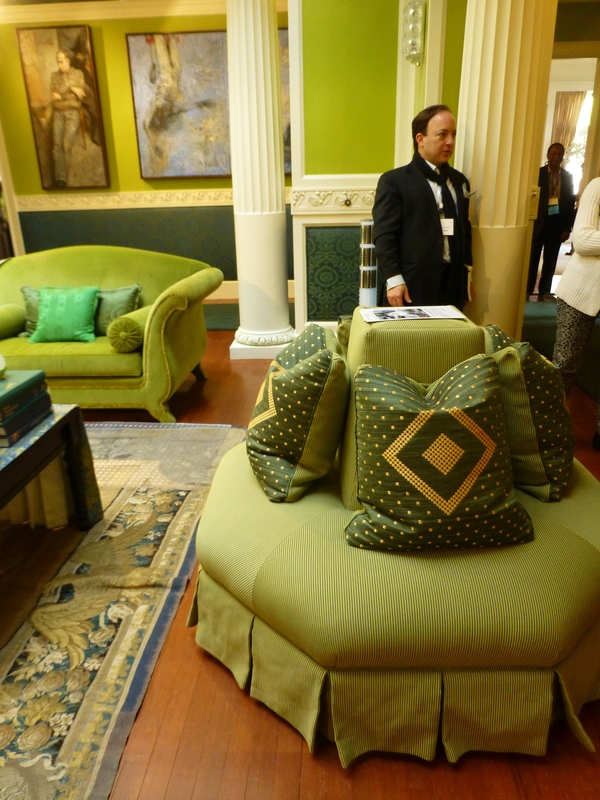 Placed upon the luxurious upholstered seat are pillows crafted from green and gold horsehair fabric. Here’s a detail of the horsehair material on the pillows. Many passersby would not even recognize this precious fabric, which is woven from the mane and tail hair of horses. Horsehair fabric is usually in the $300 and up price-range and has been used for centuries to upholster fine furniture. Often it is seen in a black colorway and appears relatively shiny. 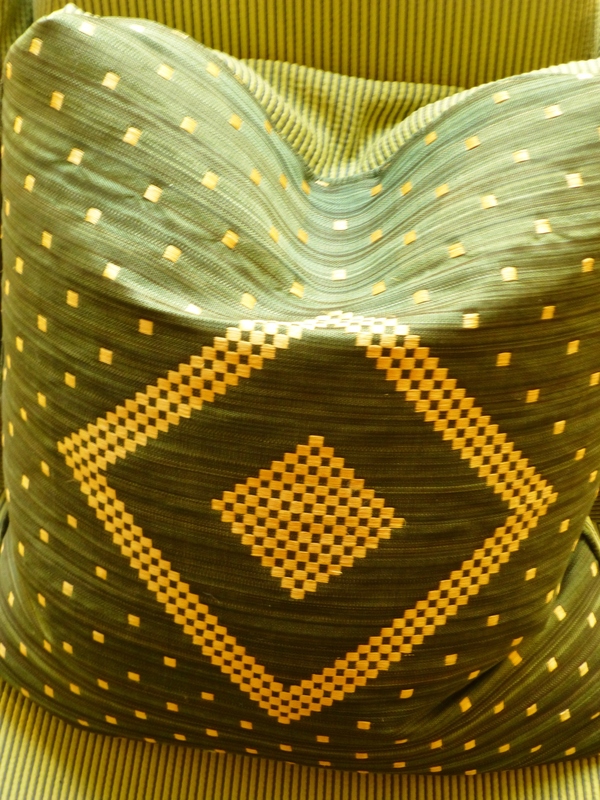 It is still being produced today by several high-end fabric houses. I admire the embroidered geometric pattern on this particular example, and it looked terrific combined with the pinstriped grosgrain fabric of the borne. Notice the artwork groupings on either side of the fireplace and the phenomenal artwork displayed in the space. The vivid greens make a fabulous backdrop on which to display the artwork! Until next time, tell everyone you know about Kristine Robinson’s blog. Feel free to pin these images on Pinterest, or share on Facebook. 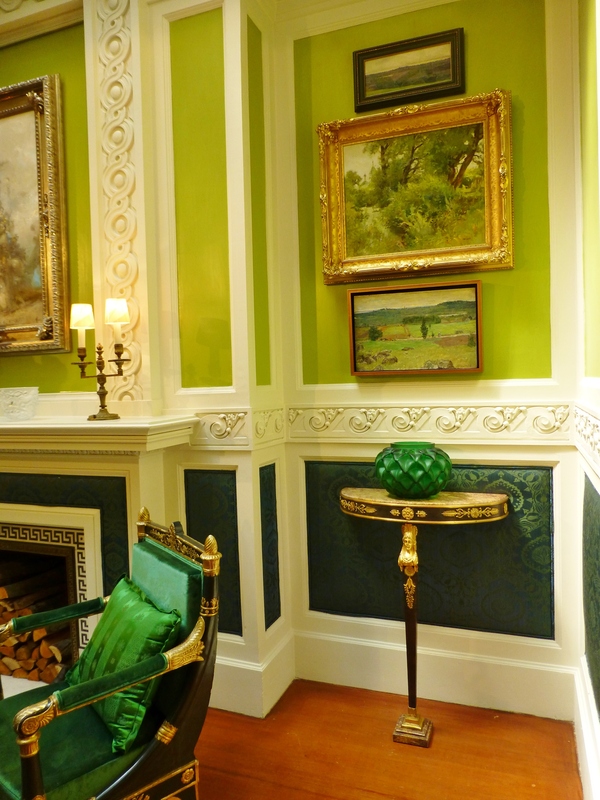 This entry was posted in Antiques, Color, Designer House, Interior Design & Decorating, Mansion and tagged 2014 Hampton Designer Showhouse, artwork, Atrium, Borne, Decor, Green, Horsehair, James Yarosh, Lalique, Mansion in May, Robinson interiors, Upholstered Walls. Bookmark the permalink.